Bread Pakora is not always the same like the street food without changing its shape. 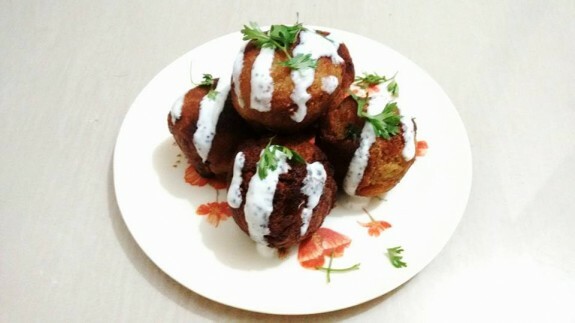 You can make the same potato stuffed bread Pakora but giving the round in shape of the Pakora. Here I will show how it could be done. 1. Mashed the boiled potato in a bowl. 2. Add coriander powder, lemon juice, chaat masala, chopped coriander leaves, black pepper powder, chopped green chilies, mayonnaise and little salt and mixed it well. 3. The bread pakora stuffing is ready. 1. Trim the edges of the bread slices. 2. Wet your palms with little water and place the slice between your palms and press it lightly to make the bread moist. (Make sure it should moist, not wet). 3. Now make a small round ball with the potato stuffing according to the size of the bread. 4. Place it on the center of the bread and mold the bread to cover the stuffing completely and give it a round shape. Repeat with all the other breads. 5. Heat about 1 inch of white oil n a frying pan. Drop the bread balls in the pan. Turn them occasionally and fry them until all the sides are golden brown. 6. It will take 3-4 minutes to cook the bread pakoras. 7. Serve your Pakora with chutney.